Technically invasive but somehow is forgiven by many; the Canary Island Date Palm (a close relative of the true Date Palm) is widespread in most tropical and subtropical lands around the world. In some areas, it’s naturalized and stands solitarily, enjoyed in the landscapes and gardens of people around the world. Here in Australia, it’s easily found in cultivation and in the wild. When people around the world think of palm trees in the tropics, they usually picture the Canary Date Palm or something very much like it. This palm is sometimes referred to as a pineapple of sorts, but this is false. Pineapples are much different from palms, most notably with pineapples growing on plants near the ground and not on trees. A large loner, Phoenix canariensis typically reaches heights of 20 metres in captivity but is found much taller in naturalized areas, sometimes reaching heights of 40 metres. The tree is single trunked with a canopy of leaves at the top as they are shed from the bottom up as the tree grows. The shape of the canopy is round and even. It does not have a crown shaft. The trunk is thick and light tank to grey, and leaf scars make up its regular notched texture. Big broom-like panicles loaded with tiny yellow flowers in the summer are scented, sometimes drooping. They are enjoyed by pollinating insects. The emerald green leaves are pinnate, up to 6 metres long each with up to 200 leaflets on each frond in a single rank on each side. They have long, sharp spines on the leaf base which can cause painful injuries. Although self-cleaning, usually fronds will be removed before expiring completely to improve the appearance of the palm tree. They leave attractive, diamond-shaped leaf scars giving the trunk its distinctive pattern. The flowers fade to form yellow and orange oval shaped fruit about 20mm long and 10mm wide that contains a single large nut. It’s said that the pulp of the fruit is very edible, but the amount makes them a pretty worthless snack for people. Some animals enjoy the fruit pulp themselves. 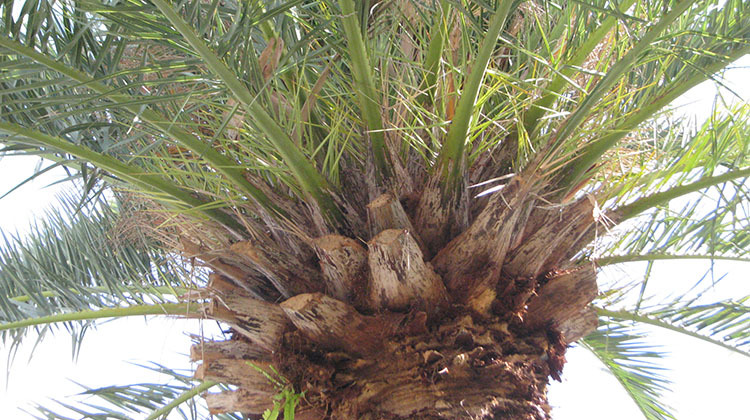 Unlike P. dactylifera, the palm used to produce commercial dates, the Canary Island Date Palm doesn’t sucker and can only be propagated by seed. Growth rate is slow. Relatively hardy for a palm that originates out of temperate areas, Phoenix canariensis can be enjoyed in areas where temperatures reach -12c on occasion. This palm is not picky about soil type either. It does require full sun exposure and well drained medium to grow in. It can tolerate salt spray which makes it a valuable coastal and urban tree in areas where it fits (this is a large palm at maturity). Plant new trees in areas with full sun exposure all day, and give this little tree plenty of room to grow. Fill the new hole with amendments such as well rotted compost and organic material to give young transplants a good boost. In Brisbane they should be watered regularly until established, but once they are comfortable you can relax on the watering and simply enjoy. The soil can be treated with a 3-1-3 fertilizer. Watch for seedlings sprouting below the tree after fruiting. Remove these seedlings to help prevent this tree from spreading. Alternatively, repot them while very small for propogating. If not done early they tend to grow away from the parent, causing them to grow skew. Canary Island Date Palms are susceptible to Fusarium Wilt, a disease caused by Fusarium oxysporum, a fungus. It is always fatal to an infected tree. It has killed several hundred date palms in Centennial Park in Sydney. Infection can be transferred from tree to tree by cutting instruments and contaminated soil. Like other palms, Canary Island date palms are sensitive to alkaline soils. They also struggle in soils with low nitrogen and zinc. I have a large canary island date palm that I need to remove. It’s about six metres tall and in good health. I’m on the sunshine coAst, do you buy trees or know who I should contact? We have a canary date palm approximately 4-5 metres in height, however it is growing on quite a lean. According to a tree looper he advised it will eventually fall over. Is there some way we can straighten it? We are in Echuca/moama and would appreciate some advice please or perhaps a contact who could assist. Hi Jen. Whether it will eventually fail and whether it can be straightened depend on a number of factors including why it’s on a lean and your soil type. You’ll really need a consulting (level 5) arborist to assess it so he can take site conditions and soil into account. Hi Shane. Sorry but the bottom has dropped out of the CIDP market due to the risk of Phytophthera infection and less big development. Give me a call if you’d like me to recommend someone to remove them: the Redlands is a little too far for me to travel for removals. Can a true Canary Island date palm( not a hybridize specimen) ever sucker throughout it’s life? Hi – hoping you can help me- We have an established canary island date palm ( approx 5-6 metres tall ?) in our garden -we are digging in front and to the side approx 900mm down and building a retaining wall for a lower garden. How far away is the minimum you recommend to build the wall from the tree base. Do they have a large root ball ? I would like to get canary island palm tree’s pruned into shape by stencil rather than free hand to get the perfect shape, do you know anyone in Brisbane that offers this service? Do you know of any companies in Melbourne that buy large Canary Island date palms? Hey guys does any one have a canary island date palm for sale ? Yes I have a 6m (approx) canary island palm for sale. Hi I was just wondering if you could give me some information on selling our palm tree. I am pretty sure its a canary date palm. Its well established. Are they worth anything and where do you go if you want to sell one. Hi Jill. We might be interested in having a look at it to evaluate it for you. Please give us a call. 🙂 David. I saw your post on an old blog. We do have a large (8-10m) Royal Palm tree (as we were told) and some Phoenix Roebelinis about 2 m high. Could you give us an idea of how much they would be worth? Selling trees is a difficult market. Your P. roebeliniis are probably worthless and if by ‘Royal palm tree’ you mean Roystonia regia then it’s not likely to be saleable either due to the large cost of transplanting it. You are welcome to phone us for a free consultation to check. We do handle sales of Canary Island date palms, smaller R. regia and other more exotic palm trees.